Over eight years ago, Mariano Abarca was shot and killed in front of his family restaurant in Chicomuselo, Chiapas, in southern Mexico. Abarca had been a key leader in his community’s fight against the social and environmental impacts of a Canadian company’s mining operations. All of the suspects in his murder were connected to the Calgary-based company, Blackfire Exploration. There never has been a full, impartial investigation. This case is being brought to Canada now because documents obtained through Access to Information show that the Canadian Embassy in Mexico supported Blackfire extensively and stands accused of being implicated in Abarca’s death. Canadian and Mexican organisations have asked the Public Sector Integrity Commissioner (PSIC) to investigate the acts and omissions of the Canadian Embassy in Mexico that they believe contributed to putting Mr. Abarca’s life in danger. He refused, so we are pursuing a judicial review of his decision. We are asking for your support in appealing the Commissioner’s rejection of this request. Check out these videos and materials and sign the petition linked here to help find justice for Mariano Abarca. 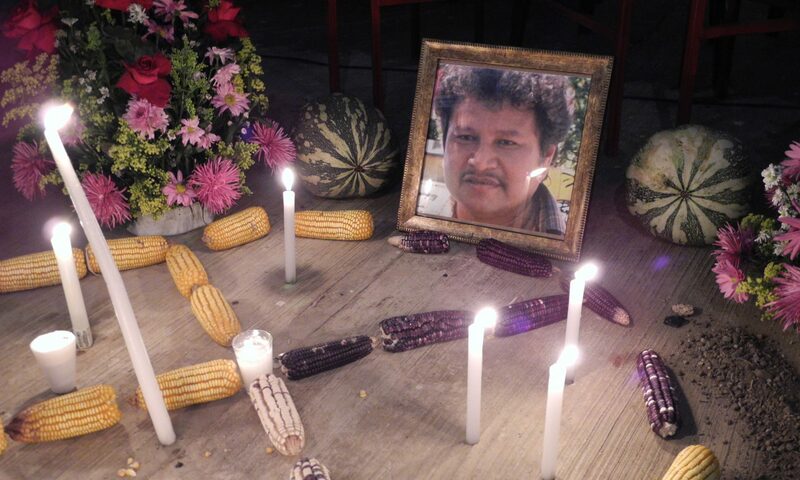 On November 27, 2009, Mariano Abarca was assassinated in front of his family restaurant in Chicomuselo, Chiapas over his leadership in the fight against the “Payback” barite mine that Blackfire Exploration operated there for two years. A father of four and founding member of the Mexican Network of Mining Affected People (REMA), Mariano received threats and attempts to intimidate him in the months before his murder. He was even imprisoned without charge based on allegations filed by company representatives. He was released for lack of evidence after eight days. Three months later, he was murdered. All of the suspects in his murder were connected to the mining company; all were eventually released. Those who ordered the “hit” were never charged. The family is still pressing for a full and impartial investigation. Since his murder, information has come to light about the consistent support that the Canadian Embassy in Mexico provided to Blackfire, despite its considerable knowledge about community conflict over the mine, and the threats that Abarca and others faced prior to his assassination. Information obtained under an Access to Information request shows how Embassy lobbied Mexican officials to help the company obtain a needed permit that was essential for putting the mine into operation and met with government officials in Chiapas to help protect the company’s interests when local residents became upset with the environmental and social impacts from the project. According to the documentation, the Embassy closely monitored the growing conflict, and yet disregarded complaints raised by Abarca and others, not only about environmental impacts from the mine, but also about armed workers acting as thugs for the company. When Abarca was detained for eight days without charge, the Embassy received 1,400 letters from across Canada and across Latin America expressing dire concern for his safety. But its communications with Mexican state officials, as revealed in the Access to Information release, were instead oriented toward protecting the company’s interests. Even after Abarca’s murder, and after the mine was shut down on environmental grounds, the documentation shows that the Embassy still provided support to the company, advising it about how it could sue the Mexican state under the terms of the North American Free Trade Agreement (NAFTA). On the basis of these findings, on February 5, 2018, the Abarca family and supporters filed a complaint with Canada’s Public Sector Integrity Commissioner (PSIC) calling for an investigation into the acts and omissions of the Canadian Embassy in Mexico that they believe contributed to putting Mariano Abarca’s life in danger. March 25 – Rally in Solidarity with Justice for Mariano as Federal Court Hears Ground Breaking Case. Time: 6:00-7:30pm, Place: Carleton University, Tory Building, room 360. The four members of the delegation as well as Shin Imai, Professor of Law (Osgoode Hall) and legal counsel to the family, will give presentations at this event. The travelling photo exhibition (see note below), will be available for viewing beginning at 5:30pm. Open to the public, refreshments will be provided. Time: 12:00-1:30pm, Place: Amnesty International Boardroom, 312 Laurier Ave. E.
Please RSVP for the Lunch and Learn to kirsten@miningwatch.ca by March 25. This travelling photo exhibition is a Canadian adaptation, realized by Marie-Josée Massicotte and Karine Vanthuyne (both Associate Professors, Faculty of Social Sciences, University of Ottawa), of a project that was originally developed by Paul Hersch Martínez in Mexico, in collaboration with Lilián González Chévez, Mariana Solorio Damián and Catalina Sedano Díaz, and the Actores Sociales of the Flora Medicinal in México (as part of the activities of the Instituto Nacional de Antropología e Historia (ASFM-INAH) and the Movimiento Moralense contra las Concesiones Mineras de Metales Preciosos). The photos and the accompanying text describe the social and environmental impacts of the dramatic development of the Canadian mining industry in Canada and abroad. In so doing, they give voice to Indigenous communities in Canada, Guatemala and Mexico that are affected by the new mining imperative. The exhibition also discusses the political, legal, economic and social changes that are required to rebalance the fundamentally unequal power relationship which, historically, has favoured the interests of the mining industry to the detriment of those of the affected communities and territories. This action – to support the complaint – is closed, but we are not giving up! We are appealing this decision, given the importance of this case to the family in their ongoing fight for justice, as well as the public interest in Canada in ensuring that the foreign service is living up to its policies, that say it will respect human rights, democracy, and the rule of law. If, in fact, officials at the Canadian Embassy in Mexico were acting under orders from Ottawa to promote and protect this Canadian mining company’s interests at all costs, then we need to know that too. Donate! to support our work!